Mobile app development is the process of making or creating a mobile application to run on various mobile platforms. A mobile platform is a mobile operating system. Apple’s mobile operating system is called iOS, Google’s mobile platform is Android, RIM has Blackberry, and Windows has Windows Mobile. 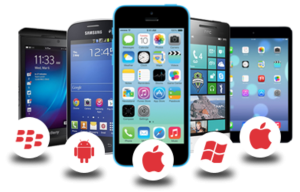 Each platform has its own rules, regulations, and requirements to make a mobile application. For instance iOS mobile apps require the use of Objective C and Android mobile applications use Java. Developing an awesome mobile application is not an easy task; both developers and business owners struggle to understand the numerous aspects of mobile app development. Many times, business owners are not able to decide which platform to choose for their new mobile app and many times developers are not able to understand the exact requirements of their customers. This causes multiple problems and unsuccessful deployments of a mobile app. 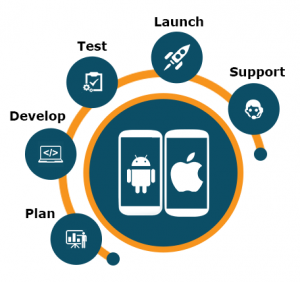 When deciding what kind of mobile application development is right for you first consider what your overall goal is. Are you making a game, informational piece, or utility? Once you know what you’re making then decide what platform would be best for your mobile application. Android has a very high market penetration however the users have a tendency of only going for free apps. Also due to the various operating system variations of Android development can be more challenging. Apple has a higher number of users and people are willing to pay more. Development is more challenging to meet Apple’s requirements on being published. -What is your budget? The average cost of an application can range from $3,000 to over a Million Dollars so it is important to define your budget. -What Platforms are you going to be on? It is important to decide where your market is, what the best way to reach them is, and what gives you the biggest opportunity. -What are your features? Apps are not websites, you need to create good features that people want to use and have a good user interface. -What are you going to do once it is published? Make sure you have a game plan of how you are going to market and push your mobile application. Server side logic is developed. Data Integration allows users to access and share information to 3rd party websites such as social networking sites. Offline data can be accessed at this phase. In the future, it’s expected that a majority of mobile app development efforts will focus on creating browser-based applications that are device-agnostic. Browser-based applications are simply websites built for mobile browsers. Such sites are built to load quickly over a cellular network and have finger-friendly navigation. If you have an app idea or want to develop an app for your website, iTransparity is here to assist you. We are a leading agency in mobile apps development in Mumbai. For more information or any queries, contact us.